We are a team of analysts focused on value and GARP ideas with catalysts. Our lead analyst has a degree in management and prior work experience in sell-side, and buy-side covering industrial and consumer sectors for an NY based hedge fund. You can read about his investment approach here. He is currently supported by staff and external consultants with experience/education in accounting, law, and management. If you have any questions please feel free to comment on our articles, message us through SA messaging system or drop us an email at gsresearch@ymail.com. We will be happy to respond. Also, please click orange "Follow" button next to our name, if you will like to receive our future ideas. Company: Gs analytics pvt. 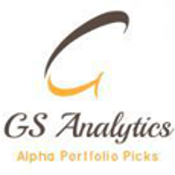 ltd.
We are a team of analysts focused on value and GARP ideas with catalysts. Our lead analyst has a degree in management and prior work experience in sell-side, and buy-side covering industrial and consumer sectors for an NY based hedge fund. You can read about his investment approach here. He is currently supported by staff and external consultants with experience/education in accounting, law, and management. If you have any questions please feel free to comment on our articles, message us through SA messaging system or drop us an email at gsresearch@ymail.com. We will be happy to respond. Also, please click orange "Follow" button next to our name, if you will like to receive our future ideas. Amazon Versus All Others: A New Risk Developing? Tile Shop: Should You Bet On The New Strategy? Jack In The Box: What Worries Me?